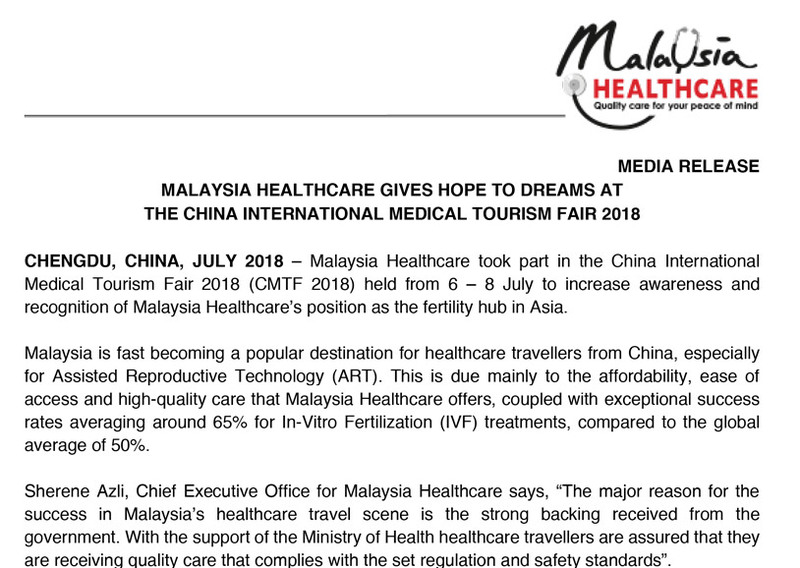 CHENGDU, CHINA, JULY 2018 – Malaysia Healthcare took part in the China International Medical Tourism Fair 2018 (CMTF 2018) held from 6 – 8 July to increase awareness and recognition of Malaysia Healthcare’s position as the fertility hub in Asia. Malaysia is fast becoming a popular destination for healthcare travellers from China, especially for Assisted Reproductive Technology (ART). This is due mainly to the affordability, ease of access and high-quality care that Malaysia Healthcare offers, coupled with exceptional success rates averaging around 65% for In-Vitro Fertilization (IVF) treatments, compared to the global average of 50%. Sherene Azli, Chief Executive Office for Malaysia Healthcare says, “The major reason for the success in Malaysia’s healthcare travel scene is the strong backing received from the government. With the support of the Ministry of Health healthcare travellers are assured that they are receiving quality care that complies with the set regulation and safety standards”. At CMTF 2018, Malaysia Healthcare introduced Malaysia as the Asian Hub for Fertility themed ‘Giving Hope to Dreams’, and as the Asian Hub for Cardiology, with the theme ‘The Heartbeat of Asia’. 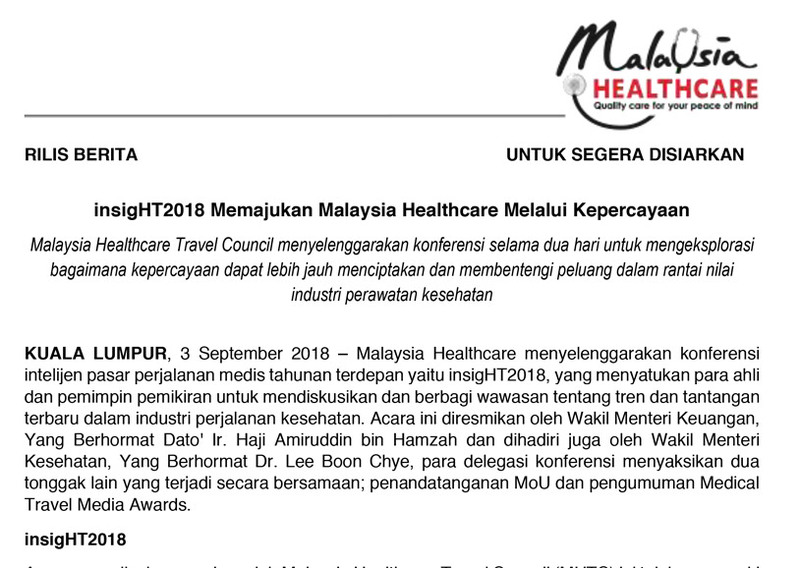 Malaysia Healthcare also highlighted its first international health campaign, Malaysia Year of Healthcare Travel in 2020 (MYHT 2020) with CMTF 2018 visitors. These are some of the key initiatives in place to propel Malaysia towards becoming the leading global destination for healthcare. Malaysia has many strengths and niche specialities in the field of fertility and cardiology with world-class, award winning hospitals available. TMC Fertility Centre and Institut Jantung Negara (National Heart Institute) both received international recognition at the International Medical Travel Journal’s (IMTJ) Medical Travel Awards 2018 as the “International Fertility Clinic of the Year” and “International Specialist Patient Centre of the Year” award, respectively. These achievements are a testament to Malaysia Healthcare’s commitment in providing unparalleled medical services. CMTF 2018 is the largest healthcare travel fair in China that leads and promotes the healthcare travel industry in China, and gathers all high-end healthcare providers from across multiple regions and countries. Malaysia Healthcare, together with Gleneagles Kota Kinabalu, Mahkota Medical Centre, and their strategic partner in China, Tai Orient, were part of over 500 prestigious exhibitors present from over 21 countries worldwide. Technologies such as Next Generation Sequencing (NGS), Time Lapse Embryoscope, PiezoICSI, and 3D Laparoscope complete a significant part of the ideal ecosystem for healthcare travellers. In addition to that, our embryologists are very experienced having received training from top medical institutions in Malaysia, UK, Australia, and the US. These digitally driven, highquality fertility treatments are offered in Malaysia at affordable costs.